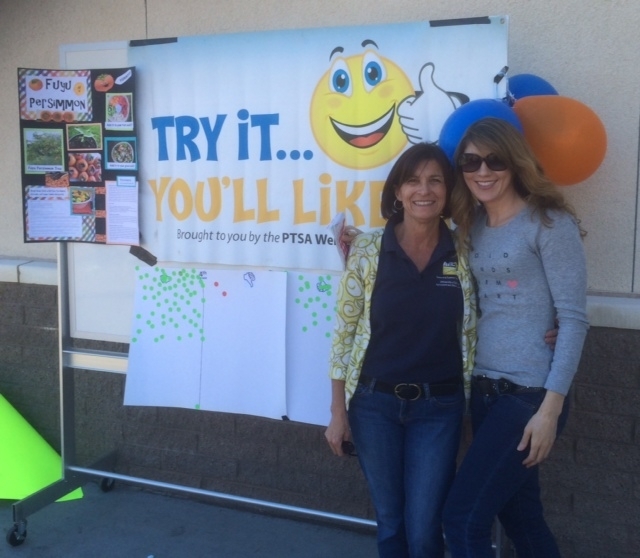 As part of the School Wellness Policy, Sycamore Canyon School in Newbury Park offers a school-wide taste testing nutrition program called, Try It You'll Like It! The program is designed to introduce youth to a variety of fruits and vegetables and raise excitement about trying something new. Monthly, seasonal tastings are offered during morning recess for grades K-5. Registered Dietitian, and parent of three boys, Chrissy Malone, understands the importance of establishing healthy eating habits in young children and says she was excited to help organize the program now in its sixth year. Past offerings have included purple carrots, sugar snap peas, kiwi, grape tomatoes, Asian pears, grapefruit, and jicama. In addition, students learn where the food comes from, how it grows, and other fun facts. The program is supported by the school PTSA and the community sponsors. As students pour out into playground the big Try it You'll Like It! sign with colorful balloons and informational display grabs their attention. Some run right over while others approach with caution. 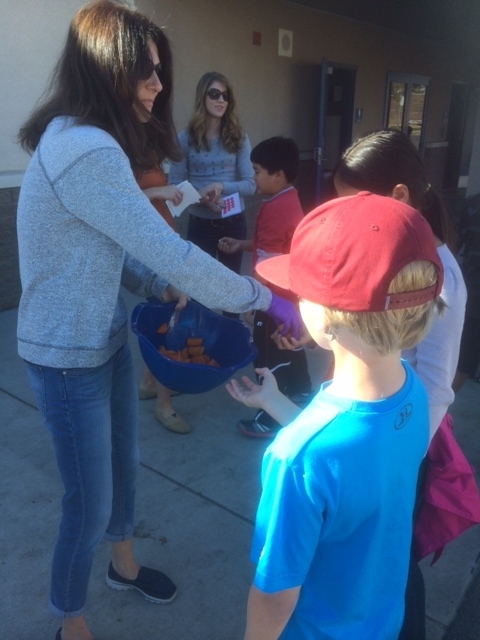 Students are greeted by friendly parent volunteers handing out samples. They are praised for participating and encouraged to vote—thumbs up or thumbs down. Grade level votes are collected and stickers are handed out for those brave enough to taste. Today, HAREC supported Try it, You'll Like It! by providing Fuyu persimmons. 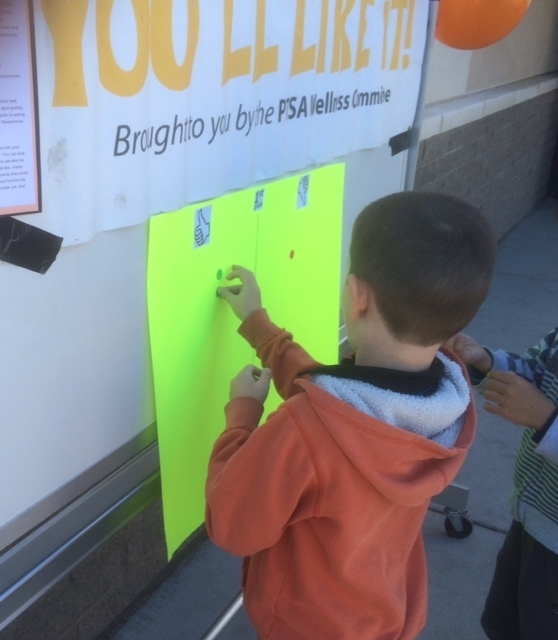 While handing out samples, the students asked many great questions…What is it? Where does it grow? What country are they from? Where can I buy these? Can I have seconds? 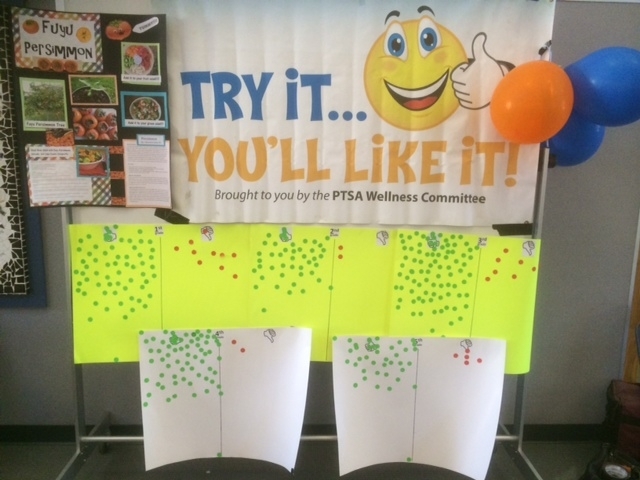 The persimmon tasting was a great success creating a buzz and spurring conversation among the students. To extend the learning opportunity to parents, Malone displays the informational poster with nutrition facts and recipes in the school office throughout the month. Over 700 students participated in today's activity and for the majority, it was definitely a thumbs up experience.